"The Star-Spangled Banner" was proudly sung by audience members at the Mesa County Fair before the Professional Bull Riders event got underway on Thursday evening. Mesa County Commissioner and Greater Grand Junction Sports Commission Executive Director (and Mesa County Fair volunteer) Jennifer Stoll catch up at the fair. Grand Junction U.S. Army recruiting officers having fun riding motorized safari animals at the Mesa County Fair. Commissioner Pugliese visits with the Grand Junction U.S. Army recruiting officers at the safari animal rides and thanks them for their service. Mesa County Commissioner Rose Pugliese and local troops at the Mesa County Fair. Mesa County Fair Ambassadors take a break after running around all morning helping out around the fair. Ambassadors finish up lunch before they go back out to help visitors with questions. 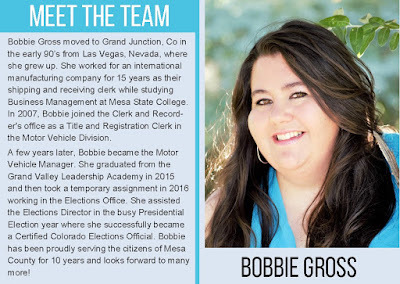 Mesa County Fair Ambassadors are the face and the voice of the Mesa County Fair. Thank you, Ambassadors! The carousel (merry-go-round) at the fair is waiting for you to hop on! You know it's fair time when you look up and see the Ferris wheel! Bear Hollow Carvers in action at the Mesa County Fair! Mesa County Fairgrounds Crew Manager Ryan Sears rototills the grounds at the Grandstand to make sure everything is leveled. A goat enjoys his haircut at the Mesa County Fair. It is hot out! A sheep gets hosed down to help keep cool. 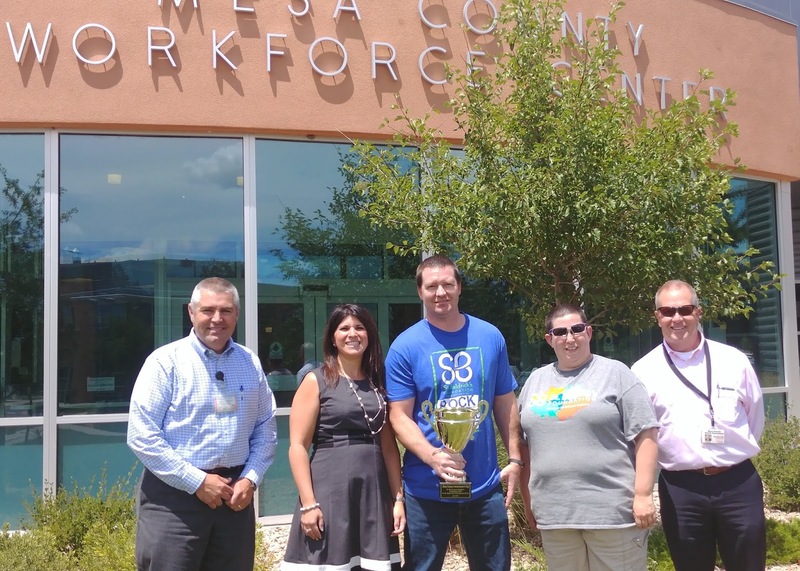 It's Mesa County Fair time! Don't miss out on great family fun, there are two more days left! What are these turkeys up to? Mesa County Commissioner Scott McInnis visits with Colorado Representative Yeilin Willett at the 2017 WSCOGA Bull Ride N' BBQ. Colorado Representative Yeulin Willett and Mesa County Commissioner John Justman catch up at the 2017 WSCOGA Bull Ride N' BBQ. Commissioner Scott McInnis and Bill Thomas chat at the Mesa County Fair. County Commissioner Scott Mcinnis, left, Office of Congressman Scott Tipton Regional Director Brian Meinhart, and Sean Norris with Shawcrow at the 2017 WSCOGA Bull Ride N' BBQ. Mesa County Attorney Patrick Coleman, left, Sean Norris and Commissioner Scott McInnis enjoy their time at the fair. Grand Junction Regional Airport Board Member Tom Benton talks to Commissioner Scott McInnis at the 2017 WSCOGA Bull Ride N' BBQ. Bull Riding returned to the Mesa County Fair this summer! World class bulls – world class riders at the Mesa County Fair. The PBR event on Thursday night had the crowd cheering. The competition was fierce! The West Slope Colorado Oil and Gas Association's Bull Ride N' BBQ event raised $5,000 for the Mesa County 4-H and Fruita FFA. Mesa County Commissioners Scott McInnis and John Justman hold the $5,000 check to present it to the Mesa County-H and Fruita FFA. Among those present to present the check was Colorado Senator Ray Scott, center left. Senator Scott waves to the audience at the 2017 WSCOGA Bull Ride N' BBQ. Colorado Representative Yeulin Willett waves at the crowd when his name is called at the 2017 WSCOGA Bull Ride N' BBQ at the Mesa County Fair. 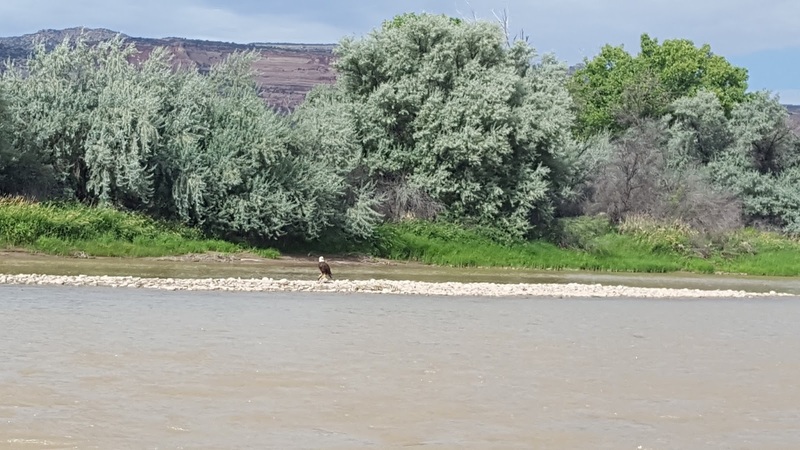 Several agencies came together to share ideas for improving a pair of western Colorado waterways last Friday, including the Tamarisk Coalition, Colorado Canyons Association, Colorado Water Conservation Board, Western Colorado Conservation Corps, Bureau of Land Management, Colorado Parks and Wildlife, and many others. 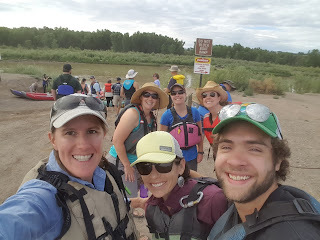 Teresa Nees with Noxious Weed & Pest Management, Shannon Hatch with Tamarisk Coalition, Erik Skeie with Colorado Water Conservation Board (and employees from Colorado Parks and Wildlife, and Colorado State Forest Service in the back row) getting ready for the trip. 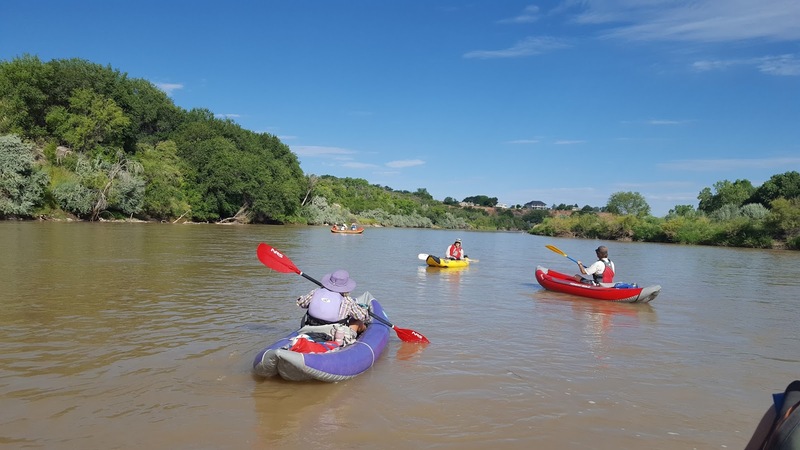 Members of One Riverfront, formerly known as the Colorado Riverfront Commission, along with partner agencies and non-profit collaborators floated down the Colorado River to get a look at the river conditions in the area. 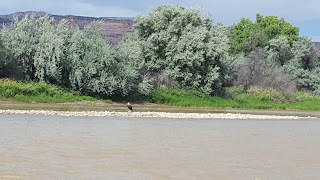 A bald eagle was spotted on the Colorado River by canoers. Members of One Riverfront organized the event to allow agencies to discuss goals of enhancing riverfront habitat, trails, and experiences along both the Colorado and Gunnison Rivers. Canoers took off from the Blue Heron Boat Launch and ended their trip at the Fruita section of James M. Robb Colorado River State Park. Employees from Mesa County Noxious Weed & Pest Management, Montrose County and the Colorado Department of Agriculture join Ouray County and private land managers to treat the high priority noxious weed meadow knapweed. 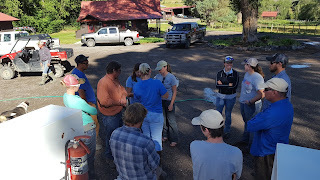 Area weed management programs frequently collaborate on projects and share labor, advice and other resources to support and strengthen weed management and promote healthy landscapes on a larger scale. Mesa County Noxious Weed staff captured this picture of sunflowers in bloom on highway 50 between Delta and Montrose. 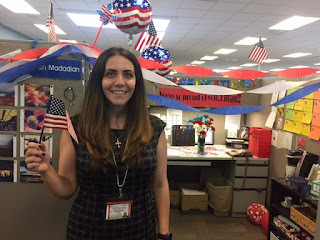 Department of Human Services Colorado Works Case Manager Lilian Madadian stands proudly in her Americana decorated office in celebration of her successful completion of her U.S. Citizenship test. Congratulations, Lilian! DHS & WFC could not be prouder. 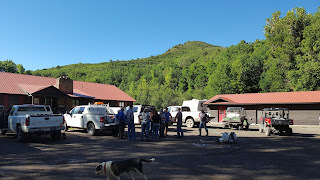 A 48-hour flood test was conducted inside the Mesa County Animal Services building, 971 Coffman Road. The 48-hour flood was done to ensure there is no water leakage into the crawl space. A ladder is placed at the entrance of the crawl space at the Animal Services Facility to help staff get down. The crawl space is several feet deep. Freshly poured concrete dries a few moments after the installation of the outer drainage at the Animal Services facility was completed and sealed. Construction crews continue to work on the interior and exterior repairs to the Animal Services facility. Rebar, a mesh of steel wires used as a tension device to strengthen and hold the concrete in tension, is installed on the masonry walls. Inside the building, wire reinforcement is laid for the topping slab. The first layer of concrete topping slab is poured on the inside of the Mesa County Animal Services building. 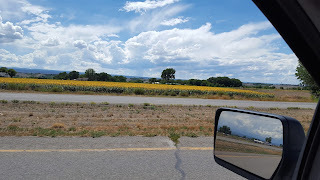 Mesa County Commissioner Rose Pugliese meets with economic development directors in Grand Junction, Montrose and Delta to discuss industrial hemp opportunities. Mesa County Commissioner, left, presents the Commissioner's Cup to Mesa County Department of Human Services Case Manager Josh Kennedy for shaving his head and raising the most money for St. Baldrick's! 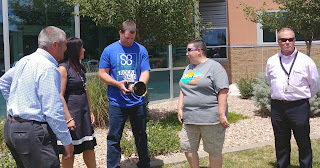 MCDHS Executive Director Tracey Garchar, Commissioner Rose Pugliese, St. Baldrick's Representative Robyn Carmine, center right and Mesa County Public Health Director Jeff, recognize Mesa County Department of Human Services Case Manager Josh Kennedy for shaving his head his head to help raise funds for St. Baldrick's, a volunteer-powered charity that funds childhood cancer research grants. 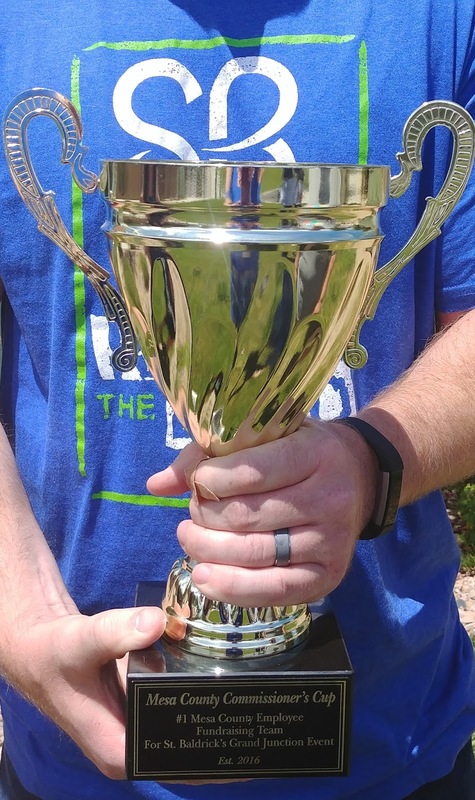 Mesa County Commissioner's St. Baldrick's Cup! Meet Motor Vehicle Manager Bobbie Gross!